This article is about industry in relation to economics. For other uses, see Industry (disambiguation). GDP composition of sector and labour force by occupation in the form of any component to economy. The green, red, and blue components of the colours of the countries represent the percentages for the agriculture, industry, and services sectors, respectively. Following the Industrial Revolution, possibly a third of the economic output comes from manufacturing industries. Many developed countries and many developing/semi-developed countries (China, India etc.) depend significantly on manufacturing industry. Slavery, the practice of utilizing forced labor to produce goods[not in citation given] and services, has occurred since antiquity throughout the world as a means of low-cost production. It typically produces goods for which profit depends on economies of scale, especially those for which labor was simple and easy to supervise. International law has declared slavery illegal. Guilds, associations of artisans and merchants, oversee the production and distribution of a particular good. Guilds have their roots in the Roman Empire as collegia (singular: collegium) Membership in these early guilds was voluntary. The Roman collegia did not survive the fall of Rome. In the early middle ages, guilds once again began to emerge in Europe, reaching a degree of maturity by the beginning of the 14th century. [need quotation to verify] While few guilds remain today[update], some modern labor structures resemble those of traditional guilds. Other guilds, such as the SAG-AFTRA act as trade unions rather than as classical guilds. Professor Sheilagh Ogilvie claims that guilds negatively affected quality, skills, and innovation in areas that they were present. The industrial revolution (from the mid-18th century to the mid-19th century) saw the development and popularization of mechanized means of production as a replacement for hand production. The industrial revolution played a role in the abolition of slavery in Europe and in North America. 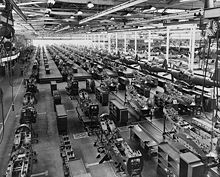 The Industrial Revolution led to the development of factories for large-scale production with consequent changes in society. Originally the factories were steam-powered, but later transitioned to electricity once an electrical grid was developed. The mechanized assembly line was introduced to assemble parts in a repeatable fashion, with individual workers performing specific steps during the process. This led to significant increases in efficiency, lowering the cost of the end process. Later automation was increasingly used to replace human operators. 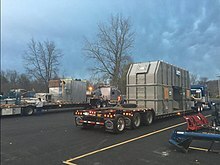 This process has accelerated with the development of the computer and the robot. Colin Clark's sector model of an economy undergoing technological change. 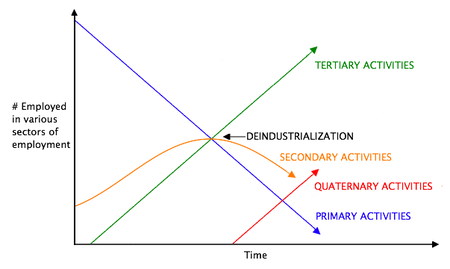 In later stages, the Quaternary sector of the economy grows. Historically certain manufacturing industries have gone into a decline due to various economic factors, including the development of replacement technology or the loss of competitive advantage. An example of the former is the decline in carriage manufacturing when the automobile was mass-produced. A recent trend has been the migration of prosperous, industrialized nations towards a post-industrial society. This is manifested by an increase in the service sector at the expense of manufacturing, and the development of an information-based economy, the so-called informational revolution. In a post-industrial society, manufacturers relocate to more profitable locations through a process of off-shoring. Measurements of manufacturing industries outputs and economic effect are not historically stable. Traditionally, success has been measured in the number of jobs created. The reduced number of employees in the manufacturing sector has been assumed to result from a decline in the competitiveness of the sector, or the introduction of the lean manufacturing process. Related to this change is the upgrading of the quality of the product being manufactured. While it is possible to produce a low-technology product with low-skill labour, the ability to manufacture high-technology products well is dependent on a highly skilled staff. An industrial society is a society driven by the use of technology to enable mass production, supporting a large population with a high capacity for division of labour. Today, industry is an important part of most societies and nations. A government must have some kind of industrial policy, regulating industrial placement, industrial pollution, financing and industrial labour. In an industrial society, industry employs a major part of the population. This occurs typically in the manufacturing sector. A labour union is an organization of workers who have banded together to achieve common goals in key areas such as wages, hours, and other working conditions. The trade union, through its leadership, bargains with the employer on behalf of union members (rank and file members) and negotiates labour contracts with employers. This movement first rose among industrial workers. The Industrial Revolution changed warfare, with mass-produced weaponry and supplies, machine-powered transportation, mobilization, the total war concept and weapons of mass destruction. Early instances of industrial warfare were the Crimean War and the American Civil War, but its full potential showed during the world wars. See also military-industrial complex, arms industries, military industry and modern warfare. For a more comprehensive list, see List of countries by GDP sector composition. The twenty largest countries by industrial output (in nominal terms) at peak level as of 2018, according to the IMF and CIA World Factbook. ^ "'Definition of Industry' Investopedia". 2003-11-20. Archived from the original on 2017-07-24. ^ "Slavery in the 21st Century". newint.org. Archived from the original on 8 May 2002. Retrieved 2018-07-15. ^ Compare: Lagerlöf, Nils-Petter (2006-08-30). "Slavery and other property rights" (PDF). Some argue that slavery died out due to the rise of industrial production modes, involving a larger number of work tasks, thus making slavery more costly in terms of supervision. ^ United Nations. "Universal Declaration on Human Rights." General Assembly of the United Nations. 1948. ^ Epstein, S.A. (1991). Wage Labor and Guilds in Medieval Europe. University of North Carolina Press. pp. 10–49. ^ Centre international de synthèse (1971). L'Encyclopedie et les encyclopedistes. B. Franklin. p. 336. ISBN 978-0-8337-1157-1. ^ Ogilvie, Sheilagh (May 2004). "Guilds, efficiency, and social capital: evidence from German proto-industry". Economic History Review. 57 (2): 286–333. doi:10.1111/j.1468-0289.2004.00279.x. hdl:10419/76314. The empirical findings cast doubt on views that guilds existed because they were efficient institutional solutions to market failures relating to product quality, training, and innovation. ^ Compare: "Industrial Revolution - Facts & Summary - HISTORY.com". HISTORY.com. Retrieved 2018-07-04. Before the advent of the Industrial Revolution, [...] [m]ost manufacturing was done in homes or small, rural shops, using hand tools or simple machines. ^ Compare: Harley, Charles (September 2011). "Slavery, the British Atlantic Economy and the Industrial Revolution" (PDF). Working Paper: 7–8. As the Industrial Revolution proceeded, the main focus of economic attention shifted to the new industries created by Britain's technological prominence. These industries looked not for protection but for an opening of export markets. As the political economy shifted, the West Indian interest became vulnerable to their opponents. The slave trade was abolished in 1807 and slavery eventually abolished in 1833. ^ More, Charles (2000). "Understanding the Industrial Revolution". London: Routledge. Archived from the original on 2011-08-14. ^ "UNCTADstat - Table view". Unctadstat.unctad.org. Retrieved 2018-05-08. Look up industry in Wiktionary, the free dictionary.